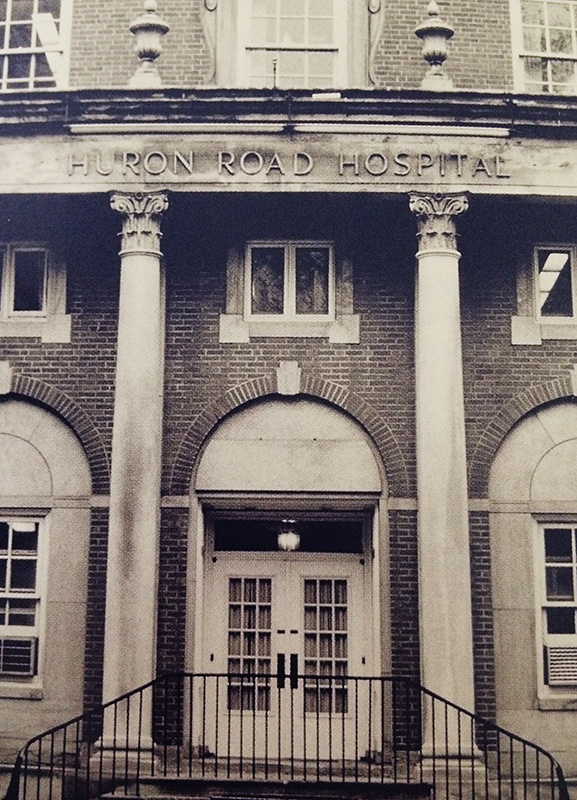 History of the Huron Hospital. Huron Hospital has an interesting and colorful history going back to the mid 1800’s. It became the first privately owned hospital in Cleveland Ohio, when Dr. Beckwith, a prominent healer, converted a house on Lake Street (now Lakeside Avenue) into a 20 bed hospital. Dr. Beckwith was devoted to the homeopathic field of medicine and subsequently helped to establish the Western College of Homeopathy. The prevailing tensions ‘of the day’ between homeopathic and allopathic physicians escalated to result in the establishment of two other hospitals (forerunners of St. Vincent Charity and University Hospitals) which barred homeopathic physicans and surgeons from membership. Not easily daunted, the Homeopaths purchased a facility that served as both homeopathic hospital and medical school, known as the Homeopathic Hospital College of Cleveland with focus on specialty training in orthopedics, surgery, gynecology and dentistry. Unlike most educational institutions of the time, the College admitted women, and graduated one of the first female professors to teach academic medicine. In addition to commitment to education and training in homeopathic philosophy, the hospital established an infirmary for poor individuals in its surrounding community. Hence, the seeds were planted that would become Huron Hospital’s roots as an organization committed to academic excellence, equality and community health. In 1873, the College purchased a building on Huron Street which became familiarly known as the “Huron Road Hospital.” Over the next 50 years, the “wars” continued between homeopathic and allopathic physicians resulting in lawsuits and injunctions preventing allopathic doctors from joining the medical staff. It wasn’t until the 1950’s that the hospital by-laws were changed to allow allopathic physicians full membership and privileges. It is interesting to note that the hospital’s original Constitution and By-laws required that at least three of its nine trustees be women, who over the course of Huron’s history, would have significant influence on hospital operations and activities. During the late 1880’s and early 1990’s, the hospital gained in prestige and served many of Cleveland’s wealthiest citizens, including John D. Rockefeller (founder of Standard Oil). The Hospital’s prominent Board of Trustees helped support and establish the Cleveland Training School for Nurses, which was the first nursing school west of the Alleghenies. The school was later re-named Huron School of Nursing which trained hundreds of nurses during its long history. The School closed in 2010 when it merged with Cuyahoga Community College. In the 1920s, a nursing strike over inadequate living conditions and the continuous conflict between allopathic and homeopathic physicians resulted in the hospital being closed for ‘repairs.’ The Homeopathic College did not meet standards of the American Medical Association and it was closed in 1922. In 1925, the hospital building on Huron Rd was sold to Ohio Bell Telephone Company, where they erected an ‘art deco’ sky scraper (750 Huron Rd). The hospital relocated to temporary quarters while plans were made for a new facility on land that was both purchased and donated from John D. Rockefeller. The depression years delayed construction and it wasn’t until 1935 that Huron Hospital opened at its new address on Terrace Rd in East Cleveland, Ohio, at cost of one million dollars. The new hospital ranked 5th in size in Cuyahoga County, with 204 beds. Notably there were no wards; all rooms were semi-private. From 1935 until its closure in 2011, Huron Hospital underwent four facility expansions; 1956 (capacity and physical therapy unit), 1975 (technology accommodation), 1987 (surgery pavilion) and 1999 (out-patient department). In 1984, Huron became a founding member of the Meridia Health System which joined Cleveland Clinic Health System in 1997. In June 2010, the Clinic unveiled its plan to build a $25M three story outpatient center on Huron’s campus (Stephanie Tubbs Jones Health Center). Nearly one year later, citing economic changes and greater need for community based outpatient services, Cleveland Clinic announced closure of Huron Hospital in August, 2011.